Better co-ordination of take-off and landing slots could help to tackle congestion at Europe's busiest airports, a new report has suggested. According to the study from the European Commission (EC), 28 million additional passengers could be accommodated every year in the continent's major airports without expansion. Six European airports - Heathrow, Gatwick, Paris Orly, Milan Linate, Dusseldorf and Frankfurt - already report more demand than capacity. In an effort to cope with the growth in demand some airports are planning to build extra runways, but many others continue to experience worsening "capacity constraints". Europe's airspace is now being used by 26,000 flights every day, the report added. People may find it useful to have a travel insurance policy in place ahead of embarking on a journey. Better planning and use of slots alone could generate more than five billion euro (£4.3 billion) in economic benefits by 2025, the report estimates - adding up to 28 million passengers without any other modifications to airport capacity. 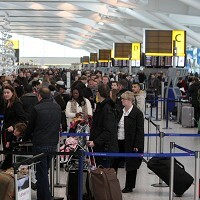 EU Transport Commissioner Siim Kallas said: "We have been concerned that the current system of allocating take-off and landing slots at airports is inefficient, giving rise to delays and congestion. This has now been confirmed by today's report, showing that up to 28 million more passengers could travel each year through Europe's airports." The commissioner said he intended to propose legislation later this year to tackle the issue. The study was drawn up by an independent transport planning consultancy.